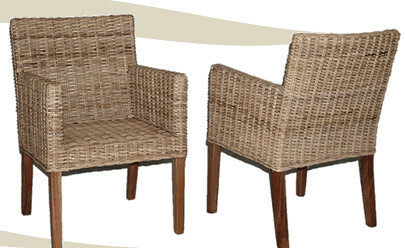 Rattan is actually a total natural material which made from Rattan Canes. It is fast growing and easier to harvest than most trees, so is an ecological alternative to wood. Most Rattan furniture is made from the skin of the plant, which is peeled of and weaved to form the various pieces of furniture. It seems like unfamiliar about kooboo grey material, however, this is now become a booming in rattan furniture industry. Kooboo grey is rattan skin which is soaked in the mud for couple of days to get the grey color in the surface. This grey color is become unique because you don’t have to use any other color to add. Furthermore, the color is already beautiful in its way and become so natural. It sometimes can put the glossy or top coat to protect the skin. This year kooboo grey are attracting so many buyers from many countries to buy the furniture from this material. The kooboo gray is like commonly rattan skin material but with brand new color. Abaca is made from black banana tree, it is only found in Philipine. It is made from banana tree layer, in Indonesia called pelepah pisang. The pelepah is remove from the tree, especially the outer layer. Then it is dried into the sun, and after completely dry, the material is ready to twist. The characteristics of abaca is stronger because it twisted. The color of abaca is very beautiful, so you no need to finish it with other color. Banana Natural is just the same with Abaca, and also mostly find in Indonesia. The colour of Pelepah is bleach by H2O2, so the black color is fade. And also it using the inner layer of banana tree, so the black color is twisted inside. It is strong, and have a big twist. Banana Natural is suitable for big living set, such as Dhaka Living set. This material can be colored with other color like white or beige. Brankas water hyacinth is made from water hyacinth. Water hyacinth is a vegetation that live in the lake or river or water lilies. The part that being used is the bole of water hyacinth, then it cut from the leaf and also the flower. After it is dried into the sun, the color is become light brown or yellow. This material characteristic is very fragile and have to treat very smooth from the beginning of the process. Flat water hyacinth material is the same as brankas water hyacinth, the difference is from the step after it is dried. It is braided to make the material stronger and beautiful. This material is good for living set and dining set. The color is dark brown with black wash or brown wash.
Rattan Croco is made from the outer skin of rattan, the color is dark, and it has bigger cut, and really nice to be made as big living room and dining room. Rattan Peel Natural is same as Rattan Croco, the difference is the skin is already bleach so the color is seems lighter and light yellow. It has smaller cut, so it can be use for small furnitures like dining chairs without arm. Seagrass is made from wild weed, sometime we can find it in savanna. Even it has to be dried first, but the color will stay the same, which is light green. The natural color will beautiful green and very popular for dining chair.